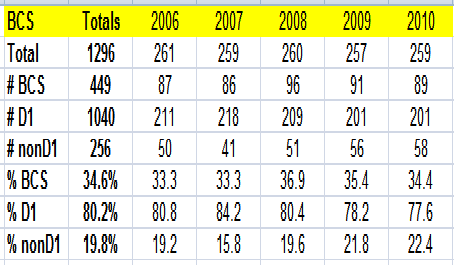 Number of games against BCS conference teams is relatively constant. Number of games played against nonD1 teams is increasing. 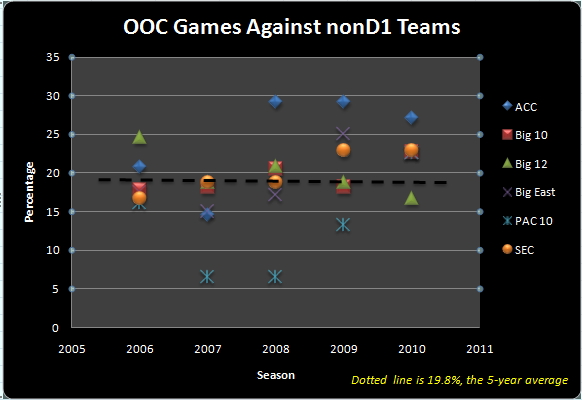 Number of games played against D1 teams is decreasing. The table below displays cumulative statistics, while the graph below illustrates percent games against nonD1 teams yearly by conferences. 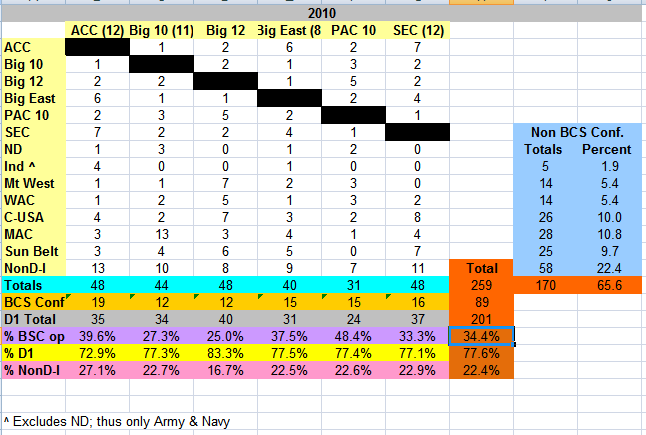 Note: In 2007, the Big 12 value is the same as the SEC (thus hidden). No doubt about it, college football is a great game. Yet, whether scheduling of out-of-conference games (OOC), bias in the polls, or no legitimate national champion, the game has its share of issues. Let us keep in mind that dollars are at the center of many debates. With this post, I’m taking an honest stand that will be unpopular with many fans – then again, that’s what I expect. Let’s start is the ACC, Big 12, and SEC. These are the 12-team BCS conferences whose fans will be excited this weekend with their conference championship game. Wait a minute – why is there a conference championship game? Sure some fans will say because they have 2 divisions. I say what a bunch of crap! This extra game is all about revenue: revenue for the conference, revenue for the host city, revenue for the network, and possibly revenue for the participating schools. Why not play everyone and only 1 OOC game? Why have a conference if all teams don’t play each other? Oh, that’s right – revenue! So how about the Big Can’t Count, most commonly known as the Big 10? Here’s a group of power elitists who not only forego a conference championship game by passing on a 12th team, each team doesn’t play 2 conference teams. Why not? Oh, that’s right. Playing more conference games would mean less home games – yep, less revenue. Let us not forget about the BCS ugly stepsister, also known as the Big East. Given a 12-game schedule and an 8-team league, at least these schools play everyone in a season, but 5 OOC games is too many. Sure it is easy to say “expand by 2 teams” (and I wish they would), but pickings are slim (Temple, Army, and Navy) unless there was a major conference reshuffling – but that won’t happen because a conference would lose it’s title game. So that leaves the PAC-10 – a 10-team conference without a conference title game, but where all teams face each other while playing 3 OOC games. (Interestingly, as a conference, they play the best OOC schedule). In my opinion, at least they serve as a model of what should be. Elitist fans will demean the existence of the nonBCS schools, and the Big East representative. Many fans will complain about the BCS format and call for a playoff. Fans will forget that the conference title game is one of the extra games working against a playoff. I can also guarantee that money is the root of the entire situation – including the money made by the conference title game. Bowl committees pick (or don’t pick) teams based on a business decision. The BCS lock-in system exists as a business decision. Meanwhile, as the upper division of college football continues to be the only major sport enterprise without a true champion, my hope of a playoff format continues to be nowhere in sight. College football’s opening week stretches over the next five days. Although a few teams face conference competition to open the college football season, most start with an out-of-conference (OOC) opponent. Despite 21.7% of BCS team’s OOC are against nonD1 teams and only 35.3% of BCS’s team’s OOC pair BCS teams against each other (source), and 69% of BCS teams OOC are at home (source), there are some interesting OOC matchups in Week 1. Here are ten OOC games that pique my interest. As a MAC grad I wonder how many games MAC teams will win this weekend? Which team will have the biggest win? Last week I had a dozen questions about college football’s all-time winning teams. This time let’s take a peak at other all-time team records with a baker’s dozen. Caution – these are tough. Answers are below the video of Cheer Cincinnati, the UC fight song. Actually, it’s not my favorite of the UC spirit songs. Let us know how you did or what you thought. 2- Michigan, Navy, Nebraska, Penn State, Syracuse, and Virginia have played the most games. Which school has played the most? 12 – Better yet, try arranging the states in #10 in order. OK, here’s a hint. The last one listed was the answer to the previous question. 13 – Here’s one on the same line. Since states have a different number of football-playing schools, these 3 states have the highest number of wins to schools ratio: Alabama, Oklahoma, and Pennsylvania. Which has the best ratio? 1 – Excluding South Florida, which member of a BCS conference has won the fewest games? Indiana, Kansas State, Rutgers, Virginia, Wake Forest – Answer: Wake Forest (406). Actually 32 fewer than Louisville, who has 1 less win than Indiana but played 211 fewer games. 2- Michigan, Navy, Nebraska, Penn State, Syracuse, and Virginia have played the most games. Which school has played the most? Answer: Michigan (1207) has played 1 more than Navy. 7 – Which school has allowed the most points? Kansas State, Indiana, Northwestern, Rutgers, New Mexico State – Answer: Northwestern (22714) followed by New Mexico State (21819). Interestingly, the Aggies have played 134 fewer games. 9 – Which school has the greatest points scored-points allowed differential? (Absolute value: thus positive or negative): Northwestern, Michigan, Oklahoma, Tennessee, USC – Answer: Michigan has the greatest scoring differential (16451) followed by Oklahoma (16225) – a wider margin than the widest negative differential (Northwestern’s -5229). 13 – Here’s one on the same line. Since states have a different number of football-playing schools, these 3 states have the highest number of wins to schools ratio: Alabama, Oklahoma, and Pennsylvania. Which has the best ratio? Answer: Alabama (Alabama, Auburn, & Troy) has 2054 wins averaging 684.67 wins per school – which is better than second place Pennsylvania’s (Penn State, Pitt, & Temple) 617.33 wins per school, just bettering Oklahoma’s (Oklahoma, Oklahoma State, & Tulsa) 616 wins per school. With college football only a short time away, here are a few trivia questions about all-time records. Of course answers are in terms of the date of this post. Answers are below the short video of my undergraduate college fight song. Go Falcons! College football air is approaching. The stores shelves contain numerous magazines. The frequency of daily news and articles is increasing. The bloggers are firing up. Spirit attire is returning to clothing departments. Trips to games are being planned. But before the pre-season rankings, let’s establish the criteria. The only thing that matters is who the team played and did they win or lose. Nothing else and nothing more – and no games have been played.